Metalheads of the world, take note, Judas Priest are releasing a new live album. 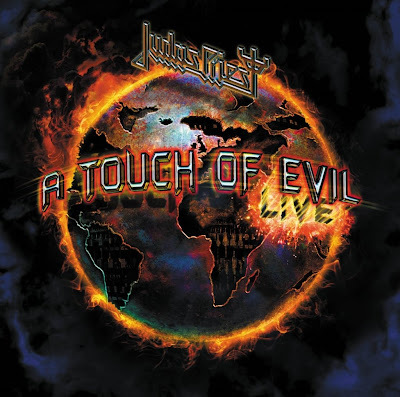 In July they will unleash A Touch of Evil: Live. The mighty Priest, Rob Halford (vocals), Glenn Tipton (guitars), K.K. Downing (guitars), Ian Hill (bass) and Scott Travis (drums) have put together an album of tracks that have all been previously unreleased in live form on CD. That means, we get the make your ears bleed guitar assault of "Painkiller" live ... nice. This also marks the first time anything from their recent concept album Nostradamus makes a live album appearance in "Death" and "Prophecy" respectively. The songs were recorded during Priest's 2005 and 2008 world tours and was produced by Tom Allom who produced their classic live album Unleashed In The East. He also produced the classic British Steel which Priest will be performing in its entirety this summer to celebrate it's 30th anniversary.